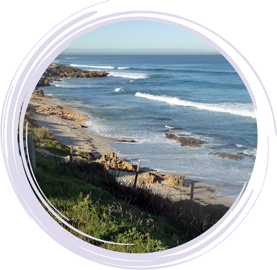 The ocean and coastal environment has a series of natural defence systems to help combat the effects of a changing coastline. Seagrass meadows are important stabilisers, trapping sand and sediments by slowing water movement. The ‘banks’ of seagrass provide a protective buffer, preventing erosion of beaches and shores from the action of waves and currents, and helping to keep the water clear. Reefs create a natural buffer or barrier against strong wind and waves that would normally erode coastlines and affect coastal communities and infrastructure, such as ports and boat moorings, canals and marina developments. Dunes provide a protective barrier between land and sea. They act as buffers against storms and king tides, and energy absorbers protecting the beach and beyond. Dune vegetation catches sand from wind erosion and stabilises the beach. Sand bars and sand beds are formed just off shore when sand is eroded from dunes during storms.This natural form of protection allows the wave energy to be dispersed onto the sand bar rather than the beach. Without this protection, the beach takes the full force of the storm. Humans have also devised ways to help combat coastal erosion, such as sea walls that are built to protect coastal buildings and groynes that are designed to trap sand passing the eroded areas.